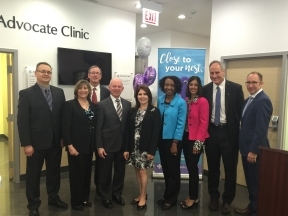 Advocate Health Care, alongside Lieutenant Governor Evelyn Sanguinetti and several healthcare officials announced it will begin operating the 56 health care clinics at Walgreens stores across the Chicagoland area. The clinics newly named Advocate Clinic at Walgreens, will give customers access to ‘high quality, affordable care options in convenient neighborhood locations while advancing Advocate’s population health and care coordination efforts.’ “Today is a significant milestone in Advocate’s nearly 25 year commitment to seeking innovative solutions to the health care delivery model and expanding access to quality care in the communities we are so privileged to serve,” said Lee Sacks, M.D., Advocate’s chief medical officer and executive vice president. 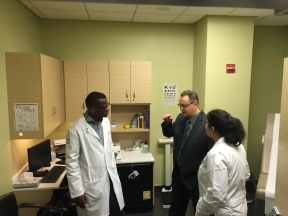 “Advocate Clinic at Walgreens allows us to deliver the right care at the right time in the right setting to ensure high quality care at a lower cost for consumers.” The clinics offer physicals, vaccinations and treatment for a range of common illnesses and injuries, including cold and flu, ear infections, strep throat, migraines, pink eye, rashes, bronchitis and upper respiratory infections, sprains, strains and more. Advocate Clinic at Walgreens will also be expanding care to children as young as six months of age by January 1, 2017. If you would like to learn more, visit www.advocateclinicatwalgreens.com.